I posted this pistol in another thread but have since come across more information that i believe, warrents a new thread. The pistol appears to be a Rollin White single shot. it is engraved with the initials W.T. Swinburne. rear admiral of the United States Navy and one-time Commander-in-Chief of theUnited States Pacific Fleet. 1866 corresponds with Swinburnes graduation from the naval academy. 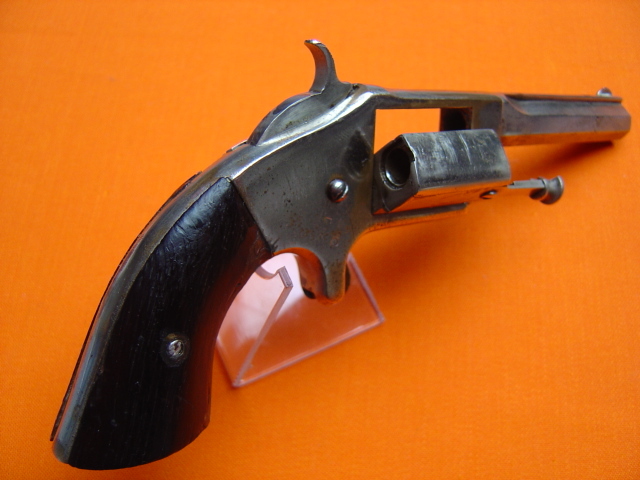 the pistol is serial numbered 420.
i looked at other models online and the frame appears to be notched to accept the cylinder so that the round can go into battery if you look at my pistol you will see that it is not notched and that the cylinder does not close flush with the frame. Note: your serial number contradicts the implied range above. Also, the RIA version has a button arrangement on either side of the chamber box, which yours does not. ''.32 r.f. caliber single shot pistol, 3" octagonal barrel, manufactured from 1861 to 1864, production is estimated at 3000.
heres one where the cylinder sits flush to the frme. mine does not .... does not at all! on the side of the frame there is a spring loaded thumb release/catch that holds the cylinder in place. Does the chamber here (red arrows) feel burred to the touch, or smooth? One possibility is that dry-firing a rimfire would pound the chamber enough to mar the metal, so that closing the cylinder would be difficult. i just got it to close with a little force. opens easily with the thumb release. Time for a gentle cleaning and lubrication. What was the point of a single shot pistol in the 1860s? How Much Confederate Railroad Rolling Stock Was There?